Libby, one of BrightHaven’s long time volunteers came to visit one day, telling us she had promised to rescue a sweet pig, who was on his way to becoming “a bunch of Christmas hams” and now she did not know what on earth to do with him, as her own house and yard was hardly big enough for her dog! “Speedy” as he was then known, started life as a 4H project, where he was raised by children, fattened up and then taken to market to be sold for slaughter. Even though kept in a very small pen, Speedy was always cruising around and consequently could not put on enough weight, and so when he finally went to market he was unable to be sold as he was underweight…”Bummer” for the 4H group—great news for Speedy!! So, Harley dodged the Christmas roast and would not be sharing a plate with over-easy eggs, but would spend the rest of his life at BrightHaven, where he would be loved, respected and taken care of for the rest of his “Hog Heaven Life”. November 29th 2002 was a quiet, serene and tranquil day, until…the horses, ducks, chickens, dogs, goose and goat froze as they heard the sound… faintly at first…a low rumble, followed by a few grunts…and then over their horizon cruised Speedy, and the chaos began! 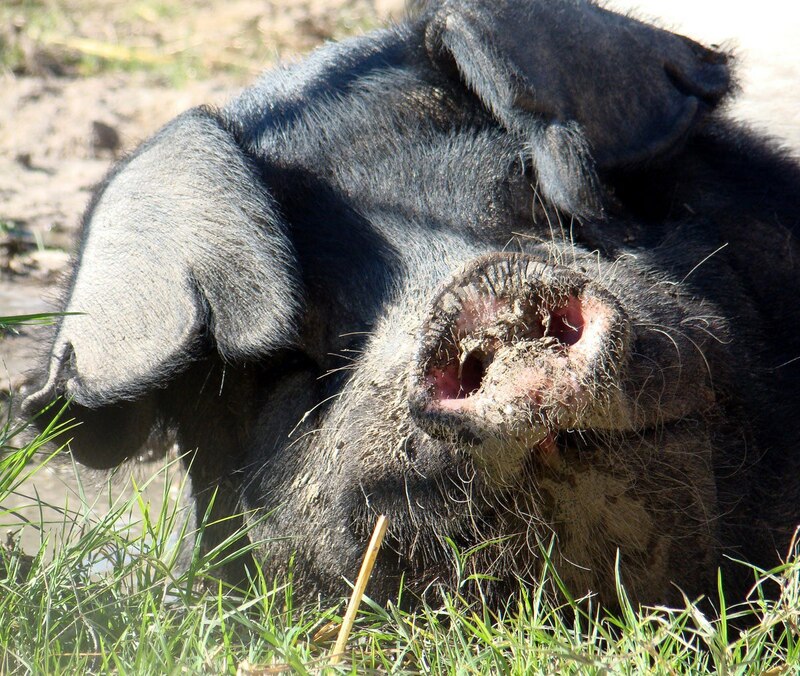 Speedy lived initially in a small holding enclosure, built by the 4H group, complete with a little pig cottage, and that first night he went into his house and slept… and snored… and snored, sounding much like the rumble of a motorbike. Then, along for a visit came good friend Jack on his Harley Davidson. Jack loved meeting our “hog” and explained to us the long-standing nickname that HD owners have for their “Harley Owners Group”—the acronym HOG!! A great fit we thought—and so Speedy became known from that day forward as “Harley”. It was decided that any self-respecting hog should have a decent size garden and, after much negotiation with the dogs, goats and ducks, an area was designated just for him. Fencing was purchased and the great day came when Harley finally had his own huge garden where he could run, roll, jump, snort and dig to his heart’s content. He soon discovered his ability to lift fences with his snout and sometimes even uproot the occasional tree…Oh Lord!!! One morning, just six short months after his arrival, Harley was clearly feeling unwell and was unable to stand up. Eventually he managed to heave to his feet but was clearly evincing pain when walking. Happily the problem resolved in just a couple of days of homeopathic care, but those days were to herald the start of his long term troubles. We had been warned he may eventually experience joint, back and muscle weakness, having been a product of over breeding, or “fattening-up for market”, and knew that consequently we must do all possible to keep his weight down by feeding him the best diet possible. Happily, in the nick of time, along came Fray Huffman to volunteer to help care for him. In no time at all, hog and lady had fallen for each other and Fray soon became the light of Harley’s life, caring for his every whim…and berating those wishing to give him delightfully fattening and naughty treats…!! Harley’s first two years were filled with little health issues, although happily his response to homeopathic remedies was remarkable and by 2004 he was so much stronger, with the incidents fewer and further between. That year, BrightHaven relocated to Santa Rosa, our current home, and of course, Harley came too. It was only around that time that we suddenly realized that our little cute pig had grown and grown and grown!!! Harley was now a handsome and giant adult, probably weighing over 700 lbs. Talented Dr.Laurie Lofton took on the role as Harley’s homeopathic veterinarian, and local large animal veterinarian and friend, Tere Crocker, fell hook, line and sinker for her most adorable new patient, stopping by at every available minute to share a story or two with her man! In the ensuing few years there were times when Harley gave cause for concern as he experienced great difficulty, not only walking, but also standing or sitting. The weakness in his back end was also visible now in his shoulders and, although still showing great responses to homeopathy, his strength was clearly, but very slowly worsening. His friends on the other hand were growing daily as his fame spread, and his fan club overflowed! This chubby-faced guy loved visitors and made friends with everyone who crossed his path, especially if they came bearing gifts. He once told animal communicator Cathy Currea that he loved his big red ball…later it transpired he actually meant the huge red apples I bought for him. His other great love turned out to be ‘french fries’ discovered by good friend Keri Lepperson, who, after sharing lunch with him several times, soon realized it would not be wise to arrive empty handed in future!! All avenues were explored and we immediately realized a wheelchair of any sort at all, would not be possible for such a huge animal. The future was beginning to look somewhat bleak for the boy who could no longer walk most days. Time marched on, with Harley’s strength and ability to stand and walk fluctuating wildly, until September 21st 2008 when he could not get up at all. Big H was down on all fours, lying on his side. After spending time in his mud hole just outside his house, Harley decided it was time for a new home and spent the next couple of weeks gradually scooting to the other end of his pasture to his final spot—under his favorite tree. Once it became clear Harley was not about to return home we were again faced with our own demons of worry. Was he suffering…too right, we mused- he must be. Was he in pain? Hmmm—tough to tell. We had tried various meds and pain killers too, but could not see a difference. Was the pain and suffering in our minds but not his, we wondered. What about his quality of life? He could eat and drink and talk and sit up and enjoy our company, but, was it all enough? We were informed that he actually could not live long in this fashion, as large animals cannot sustain life lying down. Kinder to quickly put him out of his misery they said. Harley seemed to say an emphatic no. And so we waited and hoped and prayed. Vets, chiropractors, energy healers from all walks all came to help—even Animal Control came to see what we were up to! The next months brought periods of up and periods of down until, finally we “got it”!! Harley had not the least modicum of concern—taking each day as it came along and greeting it with joy. He scooted easily, spent happy hours relaxing under his favorite tree, was hand fed twice daily by Fray, and received early morning treats from Gail. Water was constantly on hand to drink from the garden hose and we saw that big H was “happy as a pig in…”, as the old saying goes! Back in 2004 BrightHaven began the expansion of its educational program by offering animal Reiki classes taught by Kathleen Prasad, (Animal Reiki Source). A 750 lbs hog can be somewhat nerve wracking to the uninitiated, but Big H lost no time at all in captivating even Kathleen’s most nervous students with his charms and his willingness to receive Reiki—soon becoming known as a Reiki sponge! These days he is so famous that new students arrive expressing their fervent desire to meet this well recognized celebrity! Harley adores the gentle healing energy shared in Reiki and we notice that those who come wishing to offer him healing, generally leave with the understanding that somehow their own lives have been changed and healed instead. And so here we are in 2011, with Harley a gentle senior giant. Some days he can sit up, and others, not. His dear Fray continues to tend to his every need or desire—well perhaps with the exception of his sweet tooth still!! We have become well-used to the periods of our worry when he cannot even sit up but have learned to see with new eyes—his!! Harley is happy with his lot. He does not wish to die and fairly exudes his consummate will to live. He loves his food, his woman, his tree, his house, his treats, the sunshine, the gentle rain, fresh new straw and friends and visitors who come to pay tribute to the wise old man of BrightHaven. Life is not about waiting for the storm to pass…it’s about learning how to dance in the rain! Copyright: This document is © copyrighted and is the property of BrightHaven Inc. and it must not be reproduced or presented for commercial purposes without prior express written consent from BrightHaven. Giving Animals the Gift of Tomorrow! © 2019 BrightHaven. All rights reserved.